The above is the original single version of the song issued in 1970. Bowie had recently re-recorded an old Deram track, “London Bye Ta Ta”, intended as a follow-up single to “Space Oddity” in early 1970. 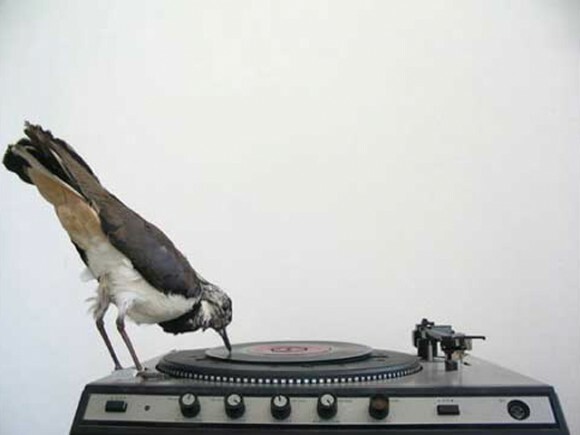 However, the same sessions had also spawned a new composition named “The Prettiest Star”. 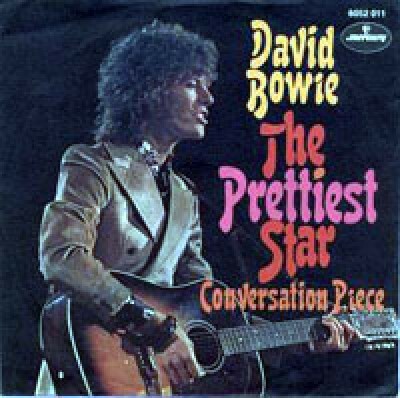 Bowie wrote it for Angela Barnett, soon to become better known as Angie Bowie, reputedly playing it down the telephone as part of his proposal to her. The track featured Marc Bolan on guitar, with whom Bowie would spend the next few years as a rival for the crown of the king of glam rock. 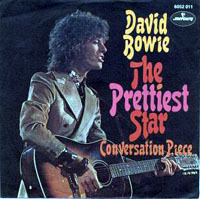 Despite receiving good notices, the single reportedly sold less than 800 copies, a major disappointment on the back of the success of “Space Oddity”. In 1973, a more glam-influenced version was recorded and released on the album Aladdin Sane, with Mick Ronson recreating Bolan’s original guitar part almost note-for-note.